I love coffee, so whenever we’re away I like to keep my eyes open for something new. When I came across Peet’s Coffee on a recent trip to Virginia, it was pretty much impossible to resist – an interesting sounding coffee with my name (almost) on it! 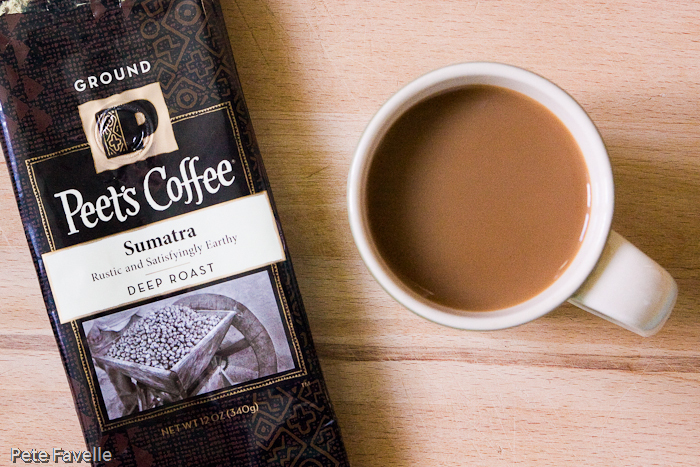 Peet’s Sumatra sounds like my kind of coffee – deep roasted with tasting notes describing it as “gutsy and glorious”; perfect Monday morning stuff! The grounds have a rich and slightly earthy aroma; black cherries and vanilla sugar blend with little hints of old, sun-baked wood. Brewed, the fruit softens and lightens and a slightly acidic edge appears; more like sour cherries now, but still rich and faintly woody. In the mouth it’s full bodied and subtly sugar sweet, with a nicely acidic kick in the finish. The cherry notes are a little lost, but in their place are touches of cocoa. The subtler flavours could do with more definition and punch, but this is most definitely gutsy and glorious – 3.5 stars.